John Travolta once said when visiting Queenstown, “This must be where God lives!” I thought the same when I arrived there. This beautiful town on New Zealand's southern island is something out of my wildest dreams. My husband, Phil, and I decided to spend three days there before heading to Australia, and I'm so glad we did. It was January 2012, which meant summertime for residents in the southern hemisphere. Looking back, I should've trusted my instincts about what to wear there. I have a bad habit of looking to travel blogs for vacation fashion, which didn't help me at all here. While scrolling through photos of summertime tourists in Queenstown, I saw happy-looking people in tank tops (known as singlets over there), shorts, and hiking shoes. Excited, I packed clothes I thought would be appropriate for the weather. It didn't take long for me to learn that 50 degrees Fahrenheit is warm for New Zealand residents, especially as they move out of their bitter winters and into the warmer months. I threw on layers of clothes, annoyed that these blogs hadn't mentioned something so important. Something else I learned that helped me stay warm: Possum fur trading is a booming industry in New Zealand, where the possums are more colorful , softer, and blessed with tremendous thermal properties. The hides are used to make hats, clothing and blankets. The fur is also spun with Merino wool to make all sorts of knitted goods. Fascinated by this, I purchased a wool and possum sweater that was hand-knitted by a local woman in her shop. It is the softest and warmest sweater I've ever worn! On our first day, we stayed at a quaint, quiet B & B called Brown's Boutique Hotel. It overlooked the beautiful Lake Wakatipu (pictured below) and gave us some of the most stunning views I've ever seen. The main shopping district was a village lined with pubs and trinket shops that reminded us of American ski towns. We decided that shopping wouldn't be our priority, but the area was still really cool. This was nothing compared to what we'd see next. On our first full day in Queenstown, we were rudely awoken by the sun, which sets at 10:30 PM and rises at 4:30 AM in the summer. We took a ten mile walk around Lake Wakatipu before driving to an old gold mining town called Arrowtown. Fun fact: European and Chinese immigrants started using this community shortly after gold was discovered there in 1862. The town was originally named after gold prospector William Fox before taking the name Arrowtown. Anyway, we found a restaurant there called Saffron and fell in love with it. Not only did the chef bust out a cookbook with the most gorgeous photography I'd seen, but the food itself was extraordinary. Saffron wasn't a staple on the menu, which included fusion dishes from around the world. We booked dinner there a second night, which isn't something we do unless the food is amazing. Driving through the Gibbston Valley was lovely (some of New Zealand's most gorgeous scenery), but our real destination was the Kawarau Gorge. Phil wanted to bungee jump into the canyon, and he did just that! After Phil got his bungee jumping out of his system, we decided to hire strangers to parachute with us. The parasailing was such a rush, and it gave us breathtaking views. We landed in a sheep field nestled in a valley, which was incredible too. The afternoon was spent driving to the area where The Lord of the Rings movies were filmed. It is the perfect tourist trap, but after seeing the lush forests, I didn't care. We hiked in the forest, half-expecting a hobbit to come bouncing out of a hole somewhere at any moment. The forest floor was covered with bright green moss and the tree trunks twisted and intertwined together with vines climbing them and hanging from high above. The tree roots bulged from the ground, making it a bit difficult to walk, and it seemed like the forest went on forever. There was a hanging bridge going over a creek that led to a beautiful meadow where sheep grazed. The morning of our last day, we spent our time exploring and walking off some of the phenomenal food we'd had in Queenstown. The weather was crazy...cold, wet...did I mention cold? However, that afternoon was by far the best part of our New Zealand experience. 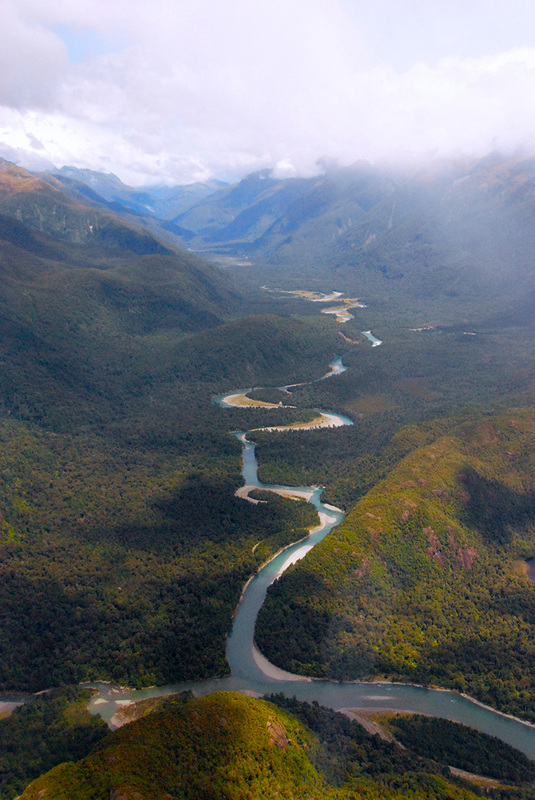 We hired the Over The Top helicopter tour company to show us the Milford Sound and the Fiords on the Tasman Sea. 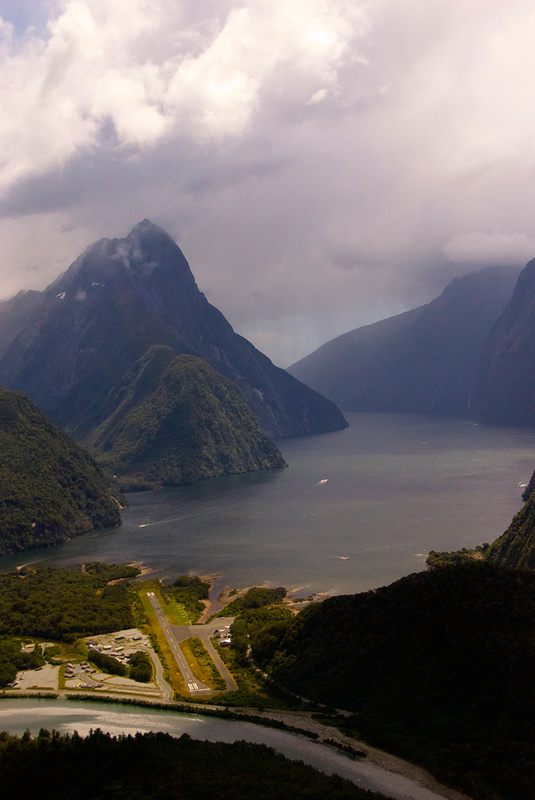 It was only a short jaunt over the mountains surrounding Queenstown to the rough granite mountains near the Tasman Sea. The waterfalls, lakes, and rivers were spectacular, and I'll never forget any of what we saw on that tour. Our pilot would drop down near a mountain lake for a close-up view of waterfalls three times the height of Niagra Falls. Our first landing was on Ruby Beach on the sea. We walked on the beach and rocks along the river. It was an amazing experience to be where few have been since there is no other access to it except by a small boat. We launched on the cliff’s updrafts again up into the nearby mountains and landed on a glacier 5,000 feet high. We walked around on the snow and treacherous granite and marveled at how much the glacier has decreased in just a few short years. Back in Queenstown, I suffered some motion sickness from the helicopter ride, but I wouldn’t trade that experience for the world! 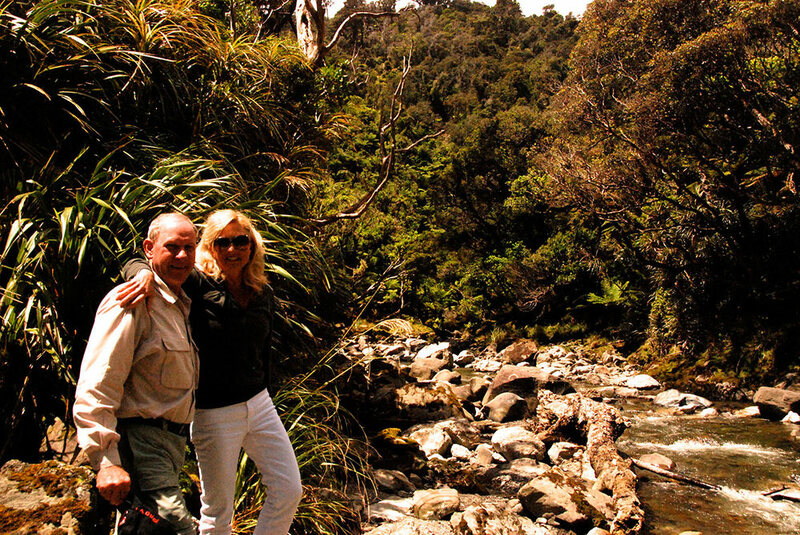 There is so much to see in New Zealand, and we experienced only a small part of it. The people we met were friendly, the food delicious, the scenery breathtaking, the weather........well, unpredictable. But in just three short days, I’d say I saw as much as one could possible see in Queenstown, and from many different perspectives. And it doesn’t take long to realize that yes, God lives here!